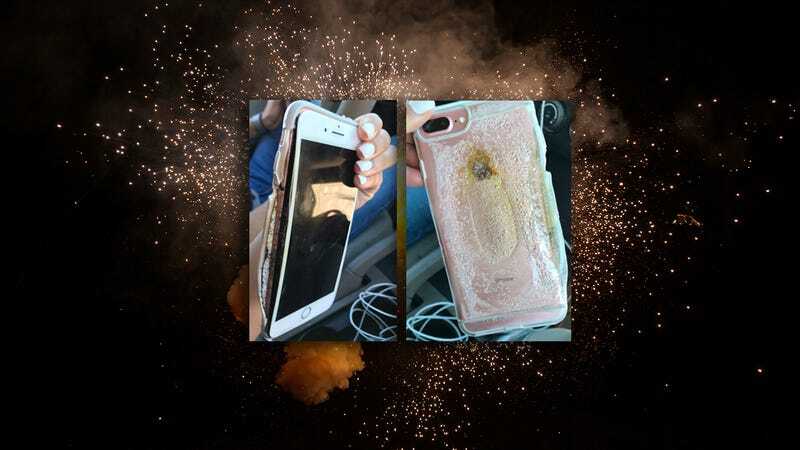 On Wednesday an Arizona teen tweeted a video of her iPhone 7 Plus smoldering in its thick plastic case after it apparently exploded. Apple is “looking into it,” according to a company spokesperson. Olivas told Gizmodo that the day before the explosion, she went to the Sprint store (where she had purchased her phone in January) because it wouldn’t turn on. She explained the Sprint employee said her phone “looked weird when it turned on,” but after running diagnostics concluded everything was fine. It wasn’t. I was asleep with my phone charging next to my head, my boyfriend grabbed the phone and put it on the dresser. He went to the restroom ... and from the corner of his eye he saw my phone steaming and [heard] a squealing noise. By the time he got over to the phone it had already caught fire, he quickly grabbed the phone and threw it in the restroom ... as soon as he threw [it] in the restroom, it blew up and more smoke started coming out of the phone. Olivas noted that the Apple Store Genius who examined her broken phone said he had “never seen anything like this.” But there might be some Apple execs tossing and turning tonight, drenched in sweat, haunted by nightmares of exploding Galaxy Note 7s transmogrifying into iPhones. While a battery explosion can result from a faulty repair or shady knockoff charger, Olivas told Gizmodo she always uses her Apple charger and didn’t have any issues with her phone until she took it to the Sprint store on Tuesday. Since neither Apple nor the phone’s owner have any idea why it burst into flames, it feels dishonest to speculate its causes. 2016, with its exploding Galaxy 7s and wild presidential election, was really just a test run. It’s 2017, baby. The reality is even more sinister than the hype. iPhones become bombs. One man’s deranged, typo-ridden tweets are America’s most pressing national security threat, and could very well set off the next world war. Nothing feels safe or certain. Olivas said she expects to hear back from Apple about what made her phone explode in about a week; hopefully answers will ameliorate our anxiety just a little bit.